Back to school always seems abrupt – it’s summer and then BANG! all of a sudden it’s back to school. Be ready for lunches and class parties with this great list of 50 back to school cookie recipes! It’s almost that time — kids are headed back to school. Are you ready? More importantly — do you have your cookie recipes in order? I love putting homemade cookies in the kid’s lunches. I think, I hope, that it is a little extra touch that tells them how very important they are to me and how much I love them. It’s tough, though. When you are busy trying to juggle home, chores, work, and relationships baking cookies end up kind of low on the priority list. There are ways to make it easier — sort of like having your cookie and eating it, too. When you do have some free time mix up a triple batch and flash freeze them. When you are ready to bake your cookies just put however many you want on a cookie sheet and bake as usual. You might just need an extra minute or two to bake them all the way through. Most drop cookies are good candidates for flash freezing. Mix up the cookie dough as directed in your recipe. Drop by teaspoons on a cookie sheet but you can put them close together. Put in the freezer and freeze until firm and no longer sticky. Put the frozen cookies in a freezer bag or storage container and freeze for up to three months. Preheat oven to the temperature specified in the recipe. Grease the cookie sheet, lay down silpat, or whatever the recipe directs. 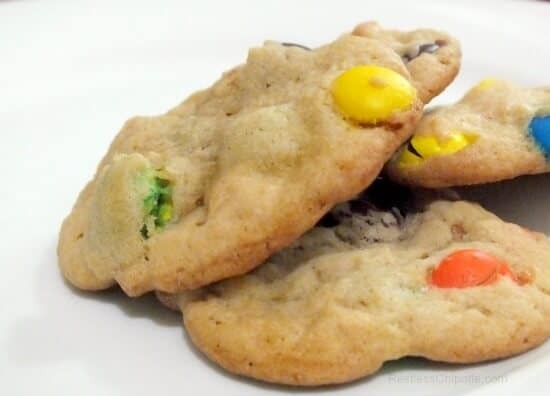 Place the frozen cookies on the cookie sheet and bake as usual. You may need an extra minute or two baking time. You know, when you have a bunch of cookies like this in the freezer you can bake them before school and put them in the lunch warm. You can throw a few in the oven a few minutes before they get home and the house will smell amazing. It’ a great way to fulfill that need to be a Kool-Aid Mom if you know what I mean. So here they are. 50 of the best back to school cookie recipes that I could find from established blogs, new blogs, and recipe sites. Take some time this weekend to make a few batches and get them in the freezer. The first day of school is just around the corner, y’all. I saw this and could not resist! What a great list of cookies! Just reading the titles has me drooling! Thanks for sharing! Thanks for stopping by… 🙂 There sure are some amazing cookie recipes out there, aren’t there? Thanks! I am always amazed at the recipe creativity of food bloggers! What a great list! I will have to check some out! Come back and let me know which you made and how you liked them. Thanks! Great idea to freeze the cookie dough for baking up a quick batch later! Thanks for the tips and the plethora of recipes! You’re welcome! Saving time is priority, isn’t it? Right? Cookies fix (almost) everything!